Stir frying is a Chinese cooking technique where ingredients are cooked in oil over a hot flame, usually in a wok to achieve the best results. A quick and easy meal, stir fries can be made using meat or vegetables, combined with noodles or rice. A quick vegetable stir fry using Asian vegetables, herbs and spices. Marinated rump steak, quickly stir fried and served with a soba noodle salad. Sambharo is a quick stir fry made usually of cabbage and carrots. It is flavoured with chillies and spices, lemon juice. It works as a side dish or a salad as well. 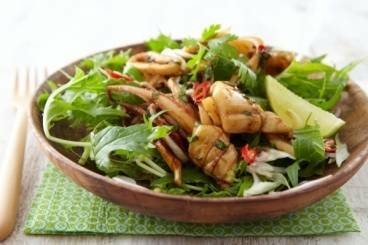 A quick and easy stir fry dish of baby squid, spiced with chilli, ginger and garlic. Served on a bed of mizuna leaves with fresh mint and coriander. A quick and easy stir fry dish of baby squid, spiced with chilli, ginger and garlic. Served on a bed of mizuna leaves, pickled vegetables and herbs. A quick and easy stir fry dish of baby corn, spiced with chilli, ginger and garlic. Served on a bed of mizuna leaves, pickled vegetables and herbs. A super quick spring vegetable stir fry with sesame and fresh herbs. Stir fried pork fillet with an aromatic vegetable and noodle broth. Pork fillet and king prawns stir fried with pepper, ginger and Chinese cabbage with a noodle broth flavoured with soy, sake and coriander cress. Stir-fried chicken breast with red onion, basil, cherry tomatoes and soy sauce served on a bed of fragrant jasmine rice.